This striped t-shirt/pullover was the one and only purchase I made at sales, and I don't know why it caught my eye. Although I like striped t-shirts and own a (rising) collection of them, this particular piece doesn't look something which would appeal my taste, as it's classic, even preppy. Not my cup of tea. But I've realized that some classic pieces could fit in my wardrobe, they create a required contrast, and I do love a quality cloth. Actually, I'm getting better and better at breaking my own rules! Linking Visible Monday, and wishing you a fabulous and safe week! Esta camiseta/jersey ha sido la única compra que he hecho en rebajas, y no sé ni porqué me llamó la atención. Aunque me gustan las camisetas de rayas y tengo una (creciente) colección, esta en particular no parece muy de mi gusto, es demasiado clásica, incluso un poquito pija. No es lo mío. Pero me he dado cuenta de que algunas prendas clásicas concuerdan en mi armario, añaden un contraste muy necesario, y además, a quién no le gusta algo de calidad. Realmente, cada vez me sale mejor saltarme mis propias normas. Y enlazo al Visible Monday y deseo a todo el mundo una semana fabulosa y a salvo! 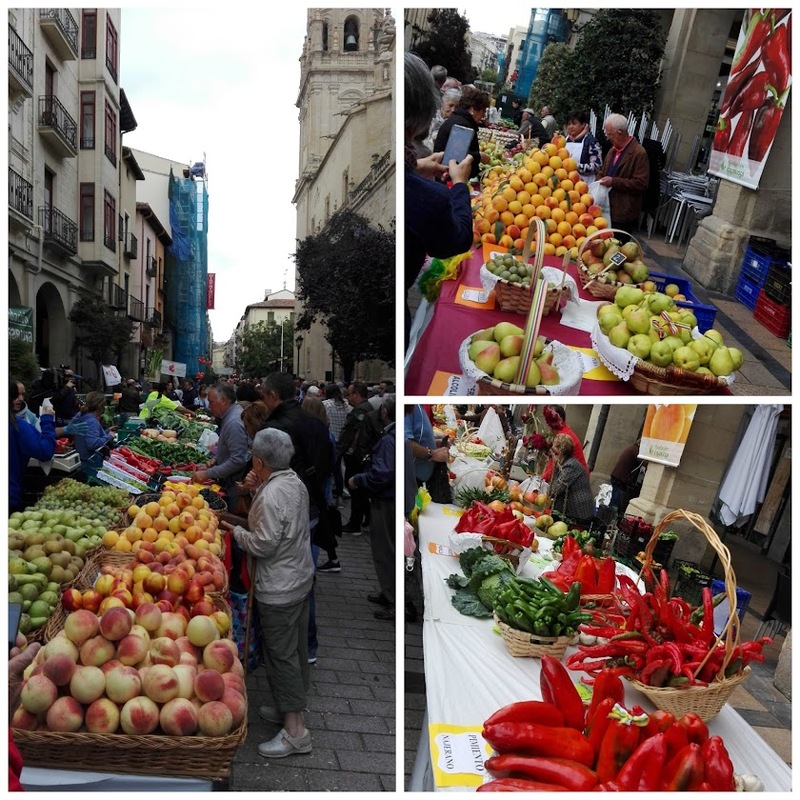 We went to see the local vegetables contest, on Sunday and we also bought some local products. It was a so colorful event! Fuimos a ver el concurso de verduras el domingo, y también compramos algunos productos locales, un evento muy colorido! Oooooo.... I wish I was visiting that show with you! I would have bought some (lots) too. I Love to see you in blue, it looks fabulous on you. How are you getting on with your hair not being bright red/pink? Are you missing it or are you enjoying the simplicity?? Actually, I'm missing my red fringe, but it has been nice to take a rest on dying it. I'll think on it after holidays! That display of fruit and veg is just wonderful! I get excited visiting my local market stall and seeing what's in season. It's a lovely top, Monica. The wide band at the bottom makes it a little different...I, too have a growing collection of striped tops - they're hard to resist! Your outfit is very cool and I love your new haircut. Fabulous fruit and veg display - it makes my mouth water! The fruit and vegetables look sooo pretty (and delicious). I like the sky and water colours in this outfit. How are you feeling about your hair without the red? I think it still looks cool with your natural brown, but I know that I missed my bright colours.